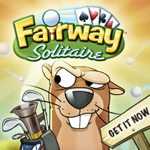 Fairway Solitaire is an addictive and witty iOS game that combines the classic card game, solitaire, with golf. Rated five out of five stars on iTunes, Fairway Solitaire was the 2012 IGN People’s Choice Award for Best Mobile Card Game. For a limited time only, get a free code for the full version of Fairway Solitaire on iPhone and iPod! Visit giveaway.fairwaysolitaire.com.